2019 will see the return of the Barbados Golf Classic to the Tamarind Hotel, after a years break. We are delighted to once again be returning to beautiful Barbados in November. This year will be a non-celeb event, however, we're confident some our regular celebs will nevertheless attend, which will be great! The package details are as follows: 7 nights bed & breakfast at the Tamarind Hotel, 2 rounds of golf at Apes Hill, 2 rounds of golf at Sandy Lane (buggies included), welcome drinks & buffett, Catamaran trip with drinks, food & music, prize giving at Sandy Lane, Gala dinner & drinks, event shirt, prizes and airport and golf transfers. £3,999.00 per couple, 1 golfer, 1 non golfer. 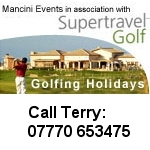 Contact donna@mancinievents.co.uk 07918 644900 should you have any questions or wish to place your booking.